That helps us to keep really a higher level vision on what we’re trying to move forward with, so we don’t get tied in with just doing the day-to-day IT operations management, or just trying to drive for installing Cerner-specific solutions. Every time we take new code, it’s understood that we’re going to be testing it. What it’s forced us to really do is build processes that allow us to be nimble and agile around implementing code and testing it. The leadership in the health system wants to use technology as a lever moving forward in its strategy. It feels it’s very vital, and this creates that organizational focus that we are going to move forward. We knew early on that we were going to have trouble doing it. We decided to keep our processes in place and try to tweak them and get as close as we can. Gamble: Hi Bryan, thank you so much for taking the time to join us today. Gamble: To give our readers and listeners the lay of the land, can you tell us a little bit about University of Missouri Health Care — what you have in the way of hospitals and clinics, things like that? Bliven: We’re an academic medical center in the middle of the state of Missouri, in Columbia. We have four hospitals here in Columbia and around 55 clinic locations here in Columbia and spread throughout mid-Missouri. We have around 500 physicians with approximately 400 residents and around 5,000 staff members. From a volume standpoint, we do around 600,000 ambulatory visits a year. Gamble: And you’re part of the University of Missouri Health System — how does that work exactly? Bliven: The University of Missouri Health System is comprised of MU Health Care — its hospitals and clinics, the School of Medicine, the School of Nursing and the School of Health Professions, and that’s part of the Columbia campus of the University of Missouri System throughout the state of Missouri. Gamble: Okay. 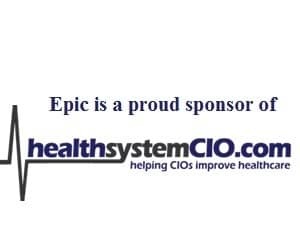 One of the things I wanted to get a little bit of information on is the Tiger Institute and your role with it, and how that plays into your role of CIO at MU Health. Bliven: The Tiger Institute is a partnership with Cerner Corporation and the university at the system level. It was founded to drive innovation in healthcare delivery and in connecting healthcare providers throughout the state of Missouri. My role is chief information officer of MU Health Care and executive director of the Tiger Institute. It’s really a dual role. The Tiger Institute was formed as really a third entity between Cerner and the university and is invested in by both parties. We actually house the IT functions of MU Health Care in the Tiger Institute. All of the staff members that were part of the university system and their IT staff moved into the Tiger Institute once it was formed. The IT function is one portion of it. We also have an HIE development arm and we have two innovation groups as part of the Institute that work on intellectual property and have an engineering team associated with them, as well as research and education. It was founded in 2009 and was really a partnership to see what Cerner and the University could do together that they couldn’t do separately. The University contributes subject matter experts and investment into the partnership with time and resources. And it’s not just from the School of Medicine and hospitals and clinics; it’s at the system level, and so we work with College of Engineering and other schools to help us broaden out the expertise that’s available to the Tiger Institute. Gamble: That’s interesting. As far as having those health IT functions housed within Tiger, is that something that you feel benefits all three different entities? Bliven: I think the unique thing about it is that separate entity that is responsible. The Tiger Institute is governed by a board of governors that are made up of executives from the university system and Cerner. The chair of the board of governors is Dr. Hal Williamson, who is the executive vice chancellor of the health system. Jeff Townsend, the chief of staff from Cerner, is on the executive board as well. That board governs the investments into the partnership and really creates accountability for both organizations. Figuring out the alignment of where we can improve together and then holding the entity accountable through governance has been really beneficial in keeping focused on tasks that the management board would like to see executed. I think that helps us to keep really a higher level vision on what we’re trying to move forward with, so we don’t get tied in with just doing the day-to-day IT operations management, or just trying to drive for installing Cerner-specific solutions. It really forces us to keep a broader vision on where do we need to be going instead of focusing on just the short term. Gamble: That’s a really interesting model. As far as the clinical application environment in the hospitals, are you using Cerner? Bliven: We’re using Cerner for our EMR. We have GE Centricity for registration, scheduling, and revenue cycle. Gamble: What about the university physicians, the group practice? Bliven: They use Cerner for their electronic medical record and they use GE for registration, scheduling and revenue cycle. We use one instance of the Cerner EMR across practices — in inpatient and outpatient, it’s the same instance, just developed with different functionality for the outpatient ambulatory setting as opposed to the inpatient side. But it’s one record. Gamble: As far as the relationship with Cerner, do you have the opportunity to either be a beta site for products or get involved in any development or giving feedback on products? Bliven: Absolutely. That’s one of the core tenets of the partnership. We normally are an early adopter of functionality. We focus on pushing the boundaries such as early adoption of Meaningful Use code. With each release that Cerner puts out, we are in some form a testing partner. As I mentioned, we have development teams here. We have an extension of Cerner’s engineering group here that focuses on development and working with the University of Missouri clinicians and staff, and that will be available to all Cerner clients throughout the work done here. It’s a goal to be released broadly. We have an innovation group that’s coming up with new ideas that we could market together. But we do have input into the engineering teams in Cerner’s World Headquarters projects as well, because we’re taking the code early, and we’re one of the first client sites that would be working through implementing new functionality. We naturally are able to provide feedback; one of the things that we built into our partnership is that closed feedback loop to Cerner for the engineering feedback. Gamble: I imagine there have been instances where feedback hasn’t always been positive, or people have had to say listen, this is not working for us. Has that happened? Bliven: Every time we take new code, it’s understood that we’re going to be testing it. What it’s forced us to really do is build processes that allow us to be nimble and agile around implementing code and testing it. So it’s really critical if we’re going to be taking code on a regular basis that we have good processes, good clinicians, staff, and operational involvement in helping us validate the code, test the functionality, and provide the feedback. We’ve worked with Cerner on this; before moving anything to production, we’ll do several rounds of feedback. We are providing constant feedback. I think one of the keys to being able to do something like that is to have that quick feedback loop, because when you start out with something, we expect that there’s going to be work to be done on it. It’s important for us to get that feedback and then get the response that, ‘yes, we’re working on this, or ‘here’s the intent of the design.’ We’re having those conversations early on — potentially, depending on the scope of what we’re working on, months to weeks before we would ever intend to actually use it in our production environments. That process on quick turnaround and feedback is crucial to it. I think what’s changed too with the Tiger Institute is there’s a focus on this development. The leadership in the health system wants to use technology as a lever moving forward in its strategy. It feels it’s very vital, and this creates that organizational focus that we are going to move forward. If we’re not satisfied with our current state, then we recognize that change is a part of modifying that, and so we plan it as best we can. There are a lot of moving parts. We do quite a lot of ongoing projects with the codes. We have to manage it very closely, and that’s something that we’re constantly evaluating — how much change can we take on at once? Gamble: That’s such a big theme we hear, just as far as change management and knowing how much change can be absorbed at once. I imagine it can be tricky when you’re a fast-moving organization. Bliven: It’s something that has changed with the advent of the partnership. I think when Tiger Institute was formed in 2009, the Cerner system hadn’t had a major update in a couple of years. Right now, we are updating code on an extremely regular basis. So we’re trying to take less of a big jump in taking a great deal of new code and functionality at once, to really smaller amounts on a very regular basis, and that’s helped us to break apart the change and focus areas where we’re working on in getting the new code instead of having to basically focus on the entire system and every workflow that we have to make a very large jump in code. It’s changed the dynamic on how we look at loading code and what it takes to do an upgrade, as we’ve just had to build processes to do it on a more regular basis. Gamble: Let’s talk about Meaningful Use Stage 2. What do you think helped your organization be one of the early ones to attest? Bliven: It was really planning it out in advance. We actually tried the quarter before and we didn’t hit the numbers. We ended up attesting Q1 of 2014 in the calendar year. But we had attempted, as I mentioned, the quarter before. We didn’t hit a couple of measures on the patient portal — view, download and transmit. We didn’t hit the numbers in sharing transitions of care. We had a great deal of learning. We spent that first quarter of attempts trying to figure out ways to help meet those metrics. We knew early on that we were going to have trouble doing it. We decided to keep our processes in place and try to tweak them and get as close as we can. if we were backing into ICD-10 when we wanted to on the hospital side — at that time, of course, we were aiming at an October 1, 2014 date ICD-10, and we had backed into the time we wanted to leave ourselves from the hospital side and then the eligible provider side before we would get to ICD-10. We thought it was very important for us at the time to be one of the early adopters, but it definitely wasn’t without pain. We felt that Stage 2 was a lot different than Stage 1. It required us working with our partners in the region, and many of them did not have direct technology, so we had to work with them to be able to get that for our transition of care. We had to put processes in place on the hospital side for adoption of our patient portal and making sure that our patients were educated on how to message their providers so that we could reach some of those thresholds.